not in use also finishes the design and is well worth the extra investment. It is also becoming quite popular to have a Jacuzzi in your garden, even in this country, where the weather might not always be at its best. Integrating a Jacuzzi into a garden design has to be considered carefully as they are much larger in reality than it appears at first and can dominate a small garden. Visibility from the neighbours overlooking the garden can also be an issue which also needs to be addressed. The jacuzzi needs to be on a firm surface and access to and from the jacuzzi needs to be integrated into the garden design. 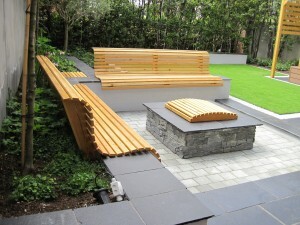 In the garden shown here, which was recently completed in Dublin, we have integrated all three of the above into the design. 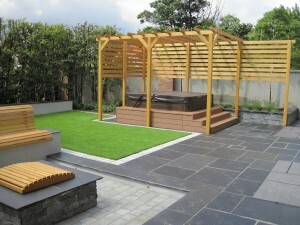 A Jacuzzi on one side of the garden with an attractive wooden Pergola for screening from the passing buses and built-in seating surrounding a fire pit on the opposite side of the garden. The two areas are linked by beautiful black limestone paving edged in kota blue limestone cobbles. For ease of maintenance, artificial grass has been used for the main space in the centre of the garden which looks great when edged with the limestone cobbles. To add height to the garden to balance the Jacuzzi, raised borders finished in stone cladding have been included on both sides of the garden with a free-standing complimentary wall to the rear of the garden. The planting includes mature espalier beech hedging on each side in the raised borders to increase the privacy together with a selection of shrubs and perennials to soften the design when mature creating a wonderful garden for relaxation and entertaining!